The magnificent sunflower is a native of Mexico and Peru and was brought to Europe in the 16th century because of its extraordinary economic value. Every part of the plant has something to otter: the leaves and stalks make fodder, cloth and paper, and a tobacco substitute; the flowers contain a useful yel­low dye; the seeds are highly nutritious and can be made into bread, or roasted to make a drink; and the seed oil is excellent for salads and cooking, being high in polyunsaturated fats. It is made into margarine, paint and soap. The pith of the stalk is one of the lightest natural substances and was used to make lifebelts. As the sunflower was dispersed around the world as a crop it began to acquire a reputation as a good folk remedy for sore throats, colds, coughs, bronchitis, asthma, whooping cough and tuberculosis. The seeds were used for intermittent fevers and ‘ague’ and were considered better than quinine for the treatment of malaria. 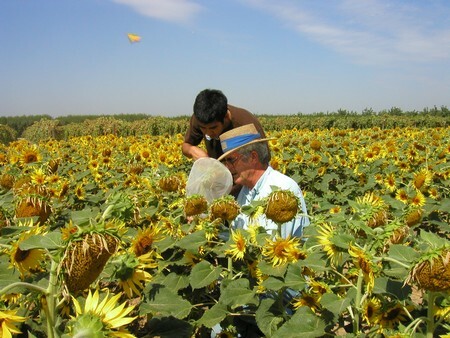 The 19th centurv settlers in America planted sunflowers near their homes as a protection against the disease. They are very useful for drying damp soils as they have a remarkable abili­ty to absorb water. They can therefore reduce disease that abounds in damp areas, including malaria carried by mosquitoes. They were also popular in Russia, Turkey and Persia for this reason. Sunflower seeds have been the subject of much investigation and found to be highly nutritious, rich in minerals including phosphorus, calcium, iron, fluo­rine, iodine, potassium, magnesium and sodium. They are also high in protein, and vitamins B and D. Inulin contained in the oil has been found effective in the treatment of asthma. Sunflower seeds also have diuretic properties, and since they aid the elimination of toxins, have been used in treatment of gout and rheumatism. The oil has also been used externally as a rub for arthritis and rheumatism. In the language of flowers the sunflower, perhaps because of the lofty heights to which it can grow, symbolizes haughtiness. As a flower remedy sunflower can be used for people who have a tendency to be egotistical, arrogant, haughty or vain. Sunflower can also be used for those who suffer from low self-esteem, or lack of self-confidence, per­haps because of conflicts with their parents, particu­larly fathers or father-figures, during childhood. As a symbol of the sun with its light, warmth and power, sunflower relates to the light in our lives that emanates from the inner self. Sunflower was used in the past to increase happi­ness in one’s life, to attract joy to replace sorrow, and today it is still used as a flower remedy to enhance our ability to shine like the sun.